When you’re going on a hike that will just last a day or less, you certainly don’t need to carry around a huge backpack. What you need instead is a daysack, which is much smaller, but still able to hold the things you need. Although daysacks go up to a capacity of 35 litres, in most instances you’ll be able to get away with something quite a bit smaller, around 20 – 25 litres. This means less bulk and weight on your back, which in turns translates to more comfortable walking. For a one-day hike, you don’t really need to take a lot with you. There’s water, of course, some lunch, a basic first aid kit, OS map or GPS, and perhaps a rain jacket and a sun hat. Anything beyond that is just a luxury, and you can probably do without it. Those items will all fit quite easily into a small daysack. Daysacks aren’t just for hiking. If you’re out for some sightseeing, or even just popping to the shops for two or three items, they can also be ideal – and a lot better than hefting a shopping bag. Most manufacturers, large and small, make daysacks, so there’s a wide range available. First you need to determine the size you need. If you do a lot of solo hiking, then a smaller daysack should be adequate. If you take your kids, or you hike as half of a couple, then you’ll need something a little larger to be able to carry everything, which can mean a 35 litre pack. A daysack will sit higher on the back than a regular rucksack, and the padded shoulder straps should be adjustable for the best fit. There should also be an adjustable waist strap to ensure the pack stays firm when you’re walking. Look for a daysack with a waterproof lining and an inner drawstring enclosure. This will make sure your items stay dry and usable in the event you’re caught in a downpour. The pack should also have two outer side pockets for carrying water bottles. A hydration pack is essentially a water bladder with a tube to allow you to drink directly. These days many hydration packs often have enough added space to effectively make them into small daysacks. 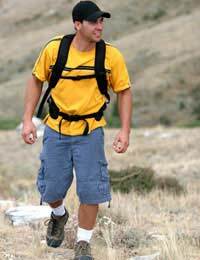 For those who are fell running or want to make sure they take in ample water when hiking, they can be very convenient. You need to look for a pack with a three litre bladder to ensure you’re carrying ample water for the day in summer. Water takes up space and it will put weight on your back, so make sure you don’t take anything more than you need in the hydration pack. With a hydration pack, as well as padded, adjustable shoulder straps, make sure there’s an adjustable waist strap and a sternum strap. That extra strap will keep the weight of the water well distributed. Ideally there will be a screw cap on the water bladder and fittings. The mouth tube should have a bite valve for ease. Empty the bladder after use, rinse with the kind of sterilising fluid used on baby bottles, than hang so the sides don’t touch each other. These steps will stop mould growing in the bladder, which will render it useless. To be fair, if you're going on a day hike that's less than 12-15 miles you can probably manage with just a water bottle rather a hydration pack, unless you're really aiming for speed. It's less weight to carry and you'll still manage to take in enough water (which is vital and don't ignore it or you can end up with nasty leg cramps). A water bottle is also a good excuse to stop for a minute or two, take off the pack and rest while you drink, rather than having a tube to drink from as you keep going.